My great-grandfather’s mid-nineteenth century 12 bore shotgun was in poor condition, a victim of generations of child’s-play. Here in part 1 I glued the stock and lightly rubbed the double barrel with 000 steel wool and Rem Oil. Letting the glue dry overnight, I lightly burnished the stock and metal fittings with 2000 grit emery paper. Following the advise of gunsinternational.com , I wiped away all oil and covered the lock, stock and barrels with paste wax, polishing it all away after it developed a haze. They recommended tinted wax to prevent white buildup in nooks and crannies but I used plain Johnson’s wax and did not notice any. I was unable to remove any screws and I did not attempt to replace any that were missing because of the gun’s fragility. 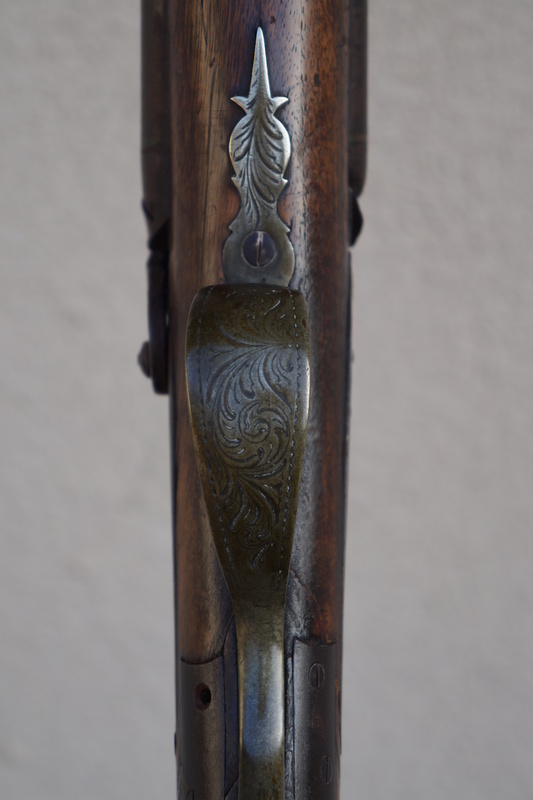 Taking the chance that I might destroy some ‘valuable patina’ on the silver-plated trigger guard, I polished it with Happich Simachrome polish. Finally I rubbed it all over with soft cotton cloths. The percussion cap, introduced circa 1820, was the crucial invention that enabled muzzleloading firearms to fire reliably in any weather-Wikipedia. Another improvement over the flintlock ignition system was the shortened lock time allowing more accuracy, and the lack of visible flash that often spooked game. Weighing a hefty 11 pounds (4.99 kg) and very long at 4 and a half feet (1372 mm), I can only imagine my ancestors trudging through the swamps and hills of Alabama toting this thing. Lacking only a replacement ramrod, this relic and family heirloom is now ready to decorate a wall. Unless noted, text and images produced and copyrighted by todgermanica.com, free for noncommercial use with attribution. Any advertisement you see here is chosen, placed and monetized by WordPress. I am not consulted nor compensated.